Our flagship OmniSeal™ Pro XL (30-793) compression tool is compatible with and terminates all IDEAL compression connectors. 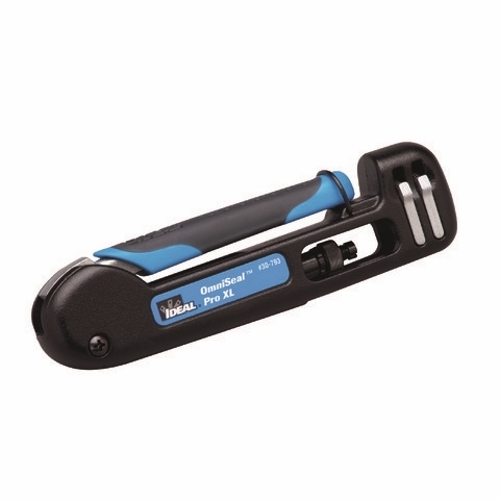 Patented dual spring clips and fixed top ledge enable this tool to compress more connectors than any other tool on the market. Unlike most compression tools which require adjustments and adapters for each type of connector, this compact 6¾“ length tool compresses all straight IDEAL compression connectors with no adjustments to the tool. F/BNC/RCA/RG-11 F connectors can all be terminated one after another with no setting changes. Only the 90° F and BNC connectors require a tool adjustment. An adjustable spin knob allows for compressive forces to be placed on the rim of the connector instead of the bottom of the nut when required. This is helpful for non-IDEAL plastic centered connectors such as 50Ω BNC‘s or RCA‘s with limited structural support. It can also be used as a larger flat surface to compress against for other types of non-traditional compression connectors. The adjustable post and spin knob, combined with three compression surface levels, give the installer virtually unlimited options for compressing current and future connector designs. The 30-793 is also available in several tool kits including the 33-793 Pro Hip Kit and 33-693 Pro Compression Starter Kit. Tool instructions: Default setting: With the handle in the closed position, the top of the compression post should be flush with the longest (center) line of the adjustment lines. If an IDEAL connector does not fully compress, raise the post setting. If the handle does not fully close when compressing, lower the post setting. All IDEAL compression connectors use the default setting, with the exception of the 90° connectors – see adjustments below. The 90° F/BNC compression connectors are the only IDEAL connectors that require the 30-793 compression tool to be adjusted. The tool can also be adjusted for non-IDEAL connectors. To adjust: Loosen the locknut by turning the post counterclockwise with a flathead screwdriver. With the handle in the closed position, lower the post with the screwdriver until the top of the compression post is even with the bottom adjustment line of the tool. Tool is now set for 90° connectors. Connector will compress against the top spring clip level. To reset tool to default position, close handle and raise post to the longest (center) adjustment mark. Re-tighten locknut by hand, then secure it with a clockwise turn of the post. No loose adapters required. 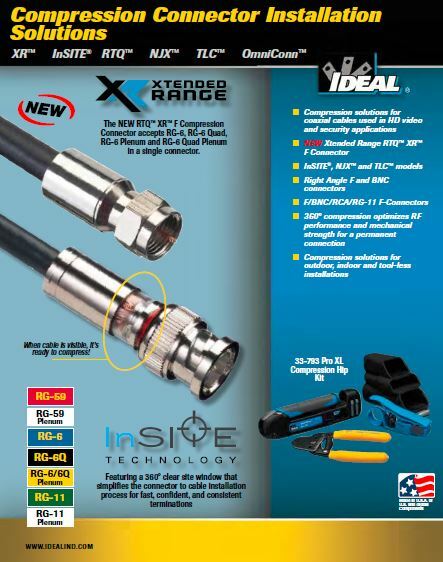 No adjustments needed for most IDEAL connectors.